Hi! My name is Katie Hazlewood! I want to help plan a magical Disney vacation for you! I love helping others experience the magic of Disney. As your Authorized Disney Vacation Planner, I will provide you with the same level of exceptional customer service that Disney is known for. When I plan a trip for someone, I spend the same time and care as if it were my own vacation. I will listen to you and plan a personalized trip that fits with your wants and needs. It would be my privilege to plan a magical and memorable vacation for your family. Disney is constantly changing, but don’t worry I will share my experience and knowledge so that you don’t have to spend time staying up with the latest Disney news. I stay in the know of all things Disney and will research to ensure a seamless planned vacation for you. I will help you choose the right resort for your family, make dining reservations, personalize touring plans for you and much more. Traveling with a baby or toddler? I have a detailed packing list and tips to ensure that every age will have fun! Celebrating something special? I believe every day is worth celebrating, let me plan extra touches that will create memories for a lifetime! What to pack for Disney? I have packing list for every season of the year! Running a Disney marathon or other RunDisney events? I have the inside scoop for you! What attractions to see and do when the park is a busy and how to avoid long wait times, is a specialty of mine! Please know that my services are 100% FREE! Let me do the hard work for you, so you can relax and enjoy the Disney magic. I am married to my Prince Charming and we have two precious children. I have a Bachelor’s degree from the University of Oklahoma, and now reside in Texas with my family. After starting a family of our own, I fell in love with Disney in a whole new way. Experiencing Disney through the eyes of your children is one of the greatest things! Let’s start planning the most magical vacation for you! 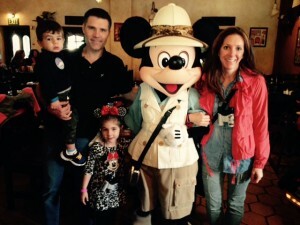 We had the most magical vacation to Walt Disney World with our three year old son. Our Disney Travel Agent, Katie Hazlewood, planned every detail for us. Stress free and fun…our my kind of vacations, thank you Katie!